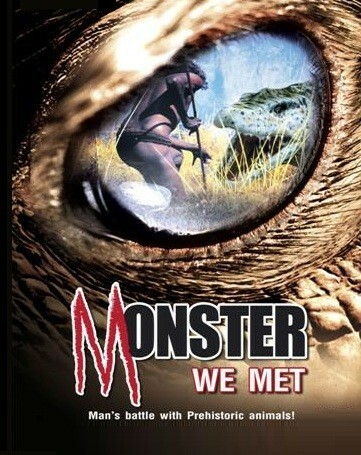 Also Called Land of Lost Monsters when it aired on Animal Planet. The first humans left their African homeland 100,000 years ago and began an epic journey that was to end with mankind dominating the globe. On their voyages they encountered monster like creatures and perilous lands that would test their powers of survival to the very limit. In this series we journey with them into an unknown world where no man had set foot before. Each film is a dramatic reconstruction of personal stories of our ancestors’ struggle for survival in a primaeval wilderness dominated by formidable predators. A world where man was both hunter and hunted. Episode 1 The Eternal Frontier – North America 13,000 years ago While the world was still in the grip of the last ice age, humans first crossed Siberia and entered the New World. They encountered creatures familiar to them from their travels, such as the woolly mammoth and the steppe bison. The Americas was the only continent where humans ever came face to face with sabre toothed cats, giant ground sloths or the massive short faced bears. Walking with Cavemen is about human evolution it was produced largely by the same team who produced Walking with Dinosaurs. 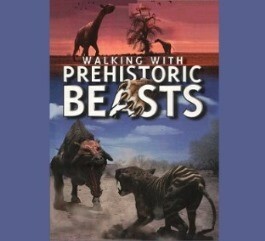 In the previous Walking with extinct animals were recreated with CGI and animatronics. 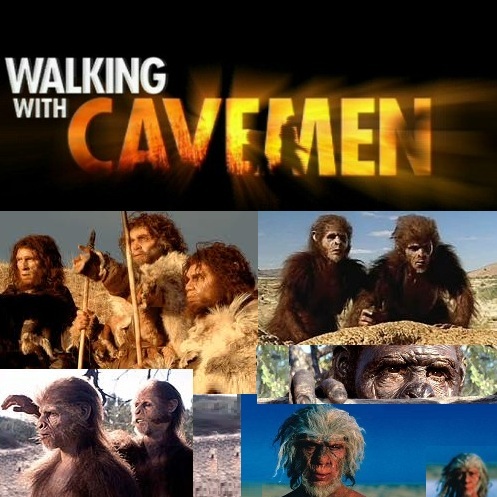 For Walking with Cavemen the human ancestors were portrayed by actors wearing makeup and prosthetics and is made in the style of a wildlife documentary, featuring a voice over narrator who describes the recreations of the prehistoric past as if they were real. Episode 1 First Ancestors – In the first episode, we see Australopithecus afarensis, and focus on their evolved bipedality (walking on just rear feet – our legs). Follows the famous Lucy and her relatives, as they first develop a leadership conflict following the death of the alpha male due to a crocodile attack, and then are attacked by a rival troupe. Prehistoric America takes goes on a journey through the prehistory of North America, beginning 14,000 years ago when people were first entering the vast and beautiful continent. Witness ancient beasts, mammoths, mastodons, giant bears and sabre toothed cats, and see how their successors, modern animals and beasts, carry on their legacy. Episode 2 Canyonlands – Modern southwestern USA (current state of Nevada). The episode focuses on the Columbian Mammoth, ground sloth and the American sabre tooth cat, Smilodon. 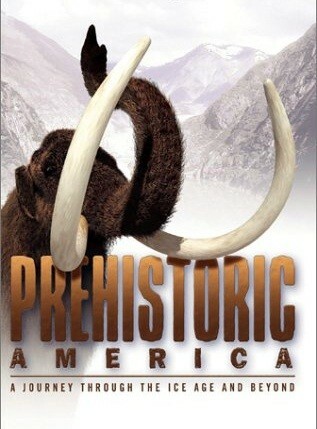 Prehistoric America takes goes on a journey through the prehistory of North America, beginning 14,000 years ago when people were first entering the vast and beautiful continent. Witness ancient beasts, mammoths, mastodons, giant bears and sabre toothed cats, and see how their successors, modern animals and beasts, carry on their legacy. Episode 3 Ice Age Oasis – talks about the modern southeastern USA (current state of Florida). The episode focuses on the American Mastodon, the ground sloth Eremotherium, Smilodon and the American glyptodon, Glyptotherium. A three episode series about life in the Paleozoic, bringing to life extinct arthropods, fish, amphibians, synapsids, and reptiles. As with previous Walking with installments, it uses state-of-the-art visual effects and draws on the knowledge of over 600 scientists and shows nearly 300 million years of history, from the Cambrian Period (530 million years ago) to the Early Triassic Period (248 million years ago). 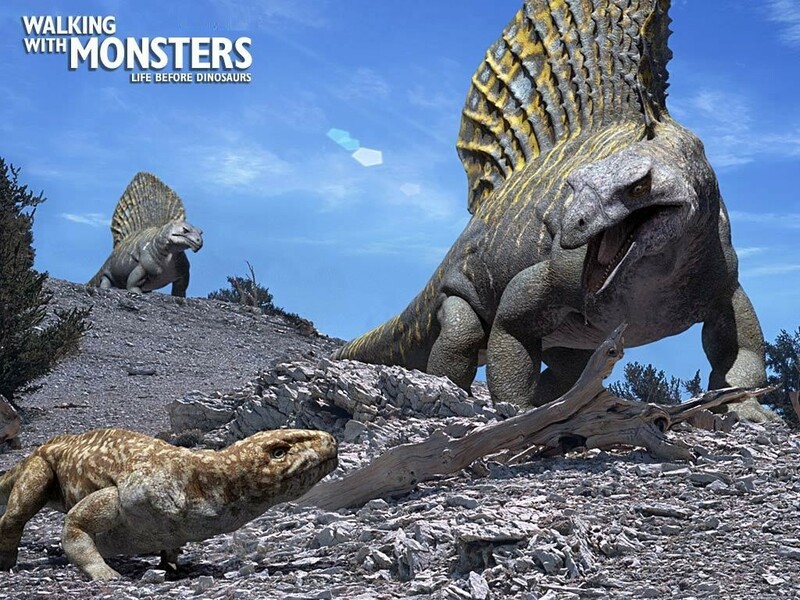 Episode 3 Clash of Titans – Set in the Late Permian, on the super continent Pangaea. In this arid climate, early therapsids, more “mammal-like” than reptile, are shown fighting to survive alongside other animals. The narrator explains that mammals are destined to be confined to the shadows as a new group of animals becomes the dominant species on Earth. The age of mammal-like reptiles is over. This is the beginning of the Age of Dinosaurs. 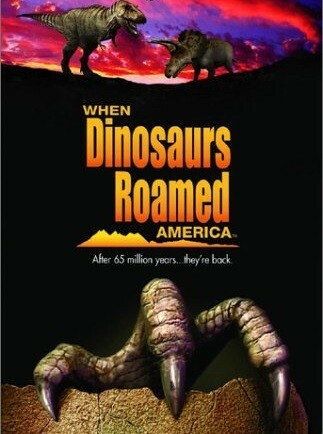 This documentary combines computer animation with live action footage to show how dinosaurs might have looked striding over the landscapes of the United States. Each portion of the U.S. is profiled to show what it looked like millions of years ago and what animals strode that particular portion of the continent. Chased By Sea Monsters a.k.a. Sea Monsters: A Walking with Dinosaurs Trilogy is about Nigel Marven travelling back in time to visit the seven deadliest prehistoric seas. He travels to those time periods on a boat called The Ancient Mariner, a 24 metre long boat with a crew. His means of time travel is never shown but the closest thing to it is his time map, that show the seven deadliest seas and the creatures that live in them. Epiosde 1 Dangerous Seas – Marks the beginning of Nigel’s quest as he travels back to NewYork in the Ordovician, 450 million years ago,a world of creepy crawlies and an alien atmosphere, to find the giant orthocone. Due to the presence of high levels of carbon dioxide, plants are not able to grow so no animals live on the land. However, in the water, it was completely different story. Chased By Sea Monsters a.k.a. Sea Monsters: A Walking with Dinosaurs Trilogy is about Nigel Marven travelling back in time to visit the seven deadliest prehistoric seas. He travels to those time periods on a boat called The Ancient Mariner, a 24 metre long boat with a crew. His means of time travel is never shown but the closest thing to it is his time map, that show the seven deadliest seas and the creatures that live in them. Epiosde 2 Into the Jaws of Death – Starts with Nigel still in the Devonian escaping the wrath of Dunkleosteus. The episode then moves on to the Late Eocene in Egypt. The Eocene marks the beginning of the mammal’s success as they begin to dominate the land and the sea, and as Nigel is about to find out, they even rule the bit in between. Chased by Sea Monsters Episode 3 To Hell … And Back? Chased By Sea Monsters a.k.a. Sea Monsters: A Walking with Dinosaurs Trilogy is about Nigel Marven travelling back in time to visit the seven deadliest prehistoric seas. He travels to those time periods on a boat called The Ancient Mariner, a 24 metre long boat with a crew. His means of time travel is never shown but the closest thing to it is his time map, that show the seven deadliest seas and the creatures that live in them. Epiosde 3 To Hell… and Back? 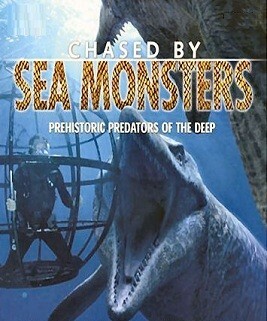 – This episode starts with Nigel still in the Pliocene still trying to attach a camera to a Megalodon. The episode then moves on to the Jurassic where Nigel comes face to face with the giant fish Leedsichthys, the marine croc Metriorhynchus and the giant monster Liopleurodon. The episode concludes in the Cretaceous, Hell’s Aquarium.